This is a book that truly resonates with me. 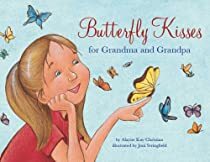 Both sets of my daughter’s grandparents live a long way away – Butterfly Kisses for Grandma and Grandpa gives a unique spin on this fairly common, logistical, family situation. Like most kids, Emily – the main character – really enjoys visiting her grandparents, the hard part is saying goodbye, even for Grandma and Grandpa. So, a special gift is given to Emily, one that will enable her to savor her memories by using her imagination and natural surroundings. It allows her to feel connected to her grandparents whenever she misses them. I love the fact that author Alayne Kay Christian is a “remote” grandmother, and that the story itself came from real experience. The fact that she is a certified life coach is just an added bonus. I found the illustrations, by Joni Stringfield, to be charming and very complimentary! Links: Joni Stringfield’s web site and blog.